Our art galleries often give us what our museums should but don’t, as is the case with this small yet chronologically comprehensive survey of work by the South African photographer Santu Mofokeng. Born in Johannesburg in 1956, Mr. Mofokeng produced some of the great pictures of the apartheid years, but his images were different from many others of the time. His interest was less in a photojournalistic documenting of battles between South African blacks and the repressive government, than in recording the dynamics of another front line: daily life in black communities. 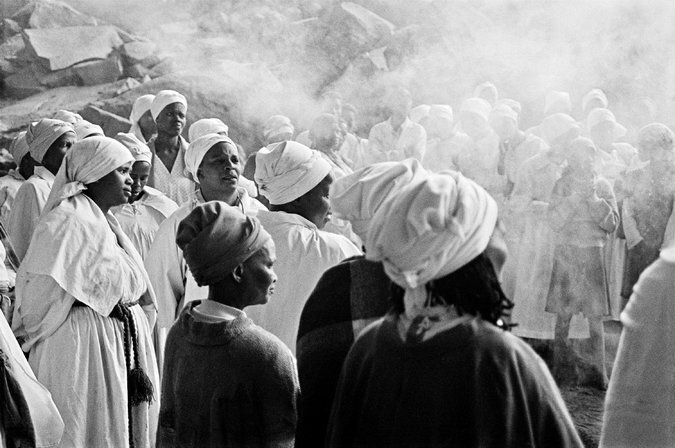 He first did this in the “Townships” series from the mid-1980s, for which he traveled to various settlements — Diepkloof, Kliptown, Soweto — created far from cities by a white separatist government, and again in the “Train Church” pictures from 1986, which capture the fervor of spontaneous religious worship that regularly took place on the commutes by workers from Soweto to Johannesburg. In one of his most forthrightly political series, begun in the early 2000s and called “Landscapes,” the human figure is absent in images depicting the sites of massacres and mass graves in South Africa and Mozambique. Spirituality is a recurrent theme. The uncomfortably tight and enclosed devotional atmosphere of the “Train Church” series opens up in 2004 with pictures of the Motouleng Cave, a rural pilgrimage site to which the artist took a brother sick with AIDS. Communal history is the thread connecting everything, most fully realized in 1997 in “The Black Photo Album/Look at Me: 1890-1950,” a book that gathers archival portraits of South African blacks dating back a century. Dressed in jackets, ties and tailored dresses for studio sessions, the sitters represent an image of Africa and Africans that apartheid tried to erase but that Mr. Mofokeng, from the start a photographic resistance-fighter, preserves, promotes and includes himself in.